Your wish has surpassed entropy. So, someone has asked about that phrase and my use of it in my signature in the thread where I introduced myself. I emailed a friend of mine, and she just got back to me half an hour ago. To begin with, the franchise is more about the girls that Kyubey contracts than about the Incubators, their goals, and everything surrounding that. What Incubators do is basically the equivalent to setting humans on fire for warmth, with magic still going on when the energy exchange stagnates. What Kyubey actually intends to do with the energy he collects from Magical Girls is left up for speculation, which especially makes sense given his secretive nature with everyone he appoints. (Not like any human would understand his race's goals any more than Incubators understand the value humans place on the lives of their own kind.) However, we do know that they leech off of a system of karma, a purely mythical concept that one cannot apply numbers to. So, yeah, in relation to my signature, the statement is only there to indicate that the five girls have all just been appointed simultaneously as Cibi (not Puellae Magi, but an AU equivalent thereto), hence also why the girls are so shocked and embarrassed (about their bodies, which he's just puffed way up in the process of forming their contracts, since they're presumed to have had no warning of that). He's also a lot bigger than they are, complete with a black background, to indicate how he now has them under his paw. Okay. Having rewatched the anime (not for the first time, but I didn't keep track previously), it turns out that Kyubey only worded it that way to Homura. The actual words are different when he grants Sayaka her respective wish. However, he does say the same thing to Konata in chapter 21 of Stars Above (a crossover with Lucky Star; the wish actually fails, though, and she remains mortal at that time), so I guess this could be a case of Beam Me Up, Scotty! (as in, something he only says verbatim once being misconstrued as a catchphrase). ...I guess this could be a case of Beam Me Up, Scotty! (as in, something he only says verbatim once being misconstrued as a catchphrase). Well, Homura's wish granted her the power of eternity. A power to endlessly repeat a month so as to generate enough karmic power within one girl to create an entirely new universe. It was more the implication of what her wish meant rather than what her wish really was. 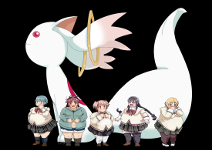 Remember, the moment Kyubey found out Homura had time powers, he immediately figured out how Madoka grew so powerful. Maybe Kyubey was aware of that happening should he grant Homura's wish to go back and save Madoka Kaname? Because, without a doubt, her wish did overcome entropy. And, wasn't on the lookout for other instances (am planning to re-read most of my manga soon, though), but I noticed while browsing the wiki page, that he actually said the same thing to Airi in chapter 5 of Kazumi Magica, even though hers is nowhere nearly as significant as Homura's or Madoka's. Funny, because I actually thought of changing my signature line to something more-encompassing, but dropped it rather quickly. "Your wishes have been granted" and "The contracts are complete", for example, seemed rather underwhelming to me. I am planning, though, to complement my signature itself with an in-the-works follow-up image (of the girls posing just like in Rebellion), at which point I'll probably change the line to something like "They paid a heavy price, and are now fit for consumption... er, action!" I still don't understand what entropy is. Is it like another word for karma or something? Like when you do something bad, something bad happens to you and when you do something good, something good happens to you. Entropy is the process of how the universe decays, and how everything someone does incurs a loss of some kind or another. It's one of the things Kyubey explains to Madoka in episode 11. One of the main laws of the universe. Entropy is what defines the direction of time. It's basically the "amount of chaos", the opposite of order. In a closed system entropy can not decrease. Any transformation of energy will lead to less low entropy energy. The rest isn't "lost" (this is where QB's explanation is wrong) but turns into uniform heat, which is a high entropy energy. If there is surplus energy somewhere it always "strives" to spread so it can be in the same amount everywhere. Thermal equilibrium is the "most desired" state of energy and matter, because this is where energy is the most evenly distributed. Actually it's because it can be proved mathematically that there are a lot more random configurations than ordered ones. So things in this universe always head towards chaos and randomness and decay - because that's the more probable state of everything. We are low entropy systems that depend on energy input (via food) to keep its order. Just deny someone of food and watch how entropy takes over. Especially when they die. So called "heat death" is going to be ugly, also it's incomprehensibly far in the future. It'll happen when everything in the universe will be nothing but evenly distributed radiation. It needs matter to break down too, but it'll happen eventually, because every particle has a half-life, not just radioactive nuclei. Even protons and quarks are going to decay, and even black holes do evaporate to Hawking radiation. Decay of the biggest supermassive black holes is estimated to happen in a googol (10^100) years or so. Give or take a few orders of magnitude, it doesn't matter. So basically everything is proceeding from order to chaos~Or am I wrong? Because complex things are not closed systems. They're drawing low entropy energy from the outside and deposit high entropy energy. Life, as a whole, has increased and is still increasing entropy while it gets more complex and fragile. It's a little oasis in the desert of increasing entropy and the sum of everything always points toward growing chaos. A needle-thin skyscraper in the endless wasteland. And it's hogging the outside resources to sustain and increase its order and complexity. Our Big Bang is a much more interesting question! I'd like to explain it but I really can't. The proto-universe's creation may even be random event just how pairs of virtual particles pop out of the vacuum just to annihilate each other in a tiny fraction of a second and disappear without a trace. Some of the pairs appear at the edge of a black hole and one of them can get away while the other is drawn in. Then it looks like that one particle is being born out of nothing. And really, it's a new particle that comes to existence. And its 'shadow' is not antimatter, but "negative matter" - it decreases the black hole's mass instead of increasing it! This is how these monsters evaporate, very-very slowly. I look Black holes with awe. They're the symbols of witch labyrinths in my works. There's a barrier around the witch, the despair event horizon from where nothing (not even light) can escape. Witches must feed because their labyrinths slowly evaporate and they die in the end. They can be found with soul gems or special equipment that detects their equivalent of Hawking radiation. The Schwarzschild radius of a typical labyrinth is small. Strong witches can be different. An unleashed Homulilly's Schwarzschild radius is an entire city. Kriemhild Gretchen's is a whole planet. And Walpurgis is something that can't exist according to the scientists - a naked singularity! Subject: Re: Your wish has surpassed entropy.